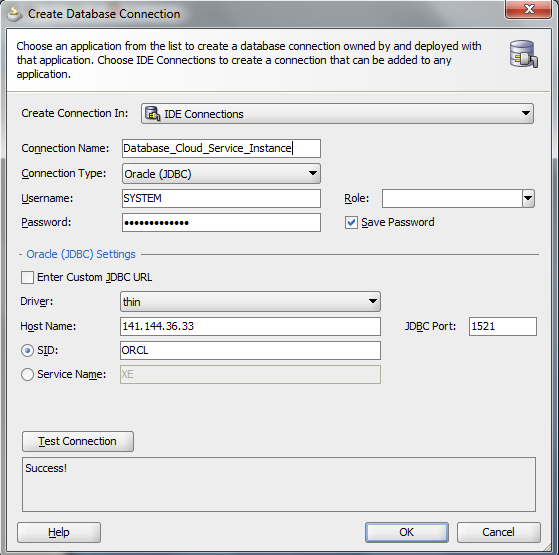 This post shows the steps that we need to follow to connect Oracle Database Cloud service Instance from JDeveloper or SQL developer. Before you start with this post, you need to have your Oracle Database Cloud service Instance and it should be up and running. If you haven't done already, you can visit below links. Follow below steps to allow instance access from outside to perform various operations. Step 1: Go to your service instance that you have setup earlier and click on the top icon as shown in below screen shot and choose "Access Rules" option. Step 2: To enable outside access second rule (ora_p2_dblistener) should be enabled which is disabled by default. To enable it, click on the icon and choose "Enable" option. Once you click on "Enable" it open below pop-up window to confirm about it, click on "Enable" to confirm it. Once you confirm it start processing your request and after few seconds, you see below screen shot where second rule (ora_p2_dblistener) gets enabled. Step 3: Now you can test the connectivity, for this post, we have used JDeveloper but you can either JDeveloper or SQL developer to test the connectivity. Mention the public IP in host name and fill other details. Once you click on test connection, it show success.